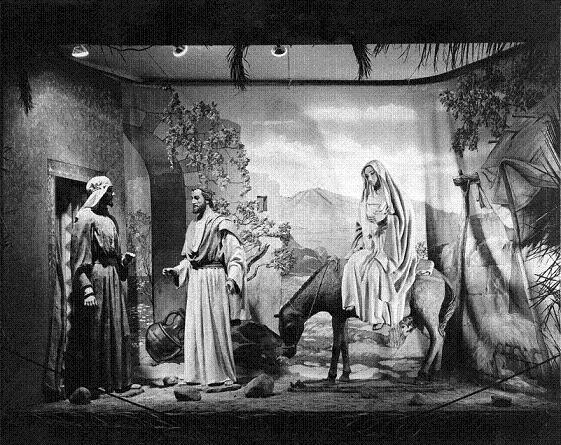 “No Room at the Inn,” circa 1967, courtesy of the Model Colony History Room, Ontario City Library. Below is the same scene in 2009. 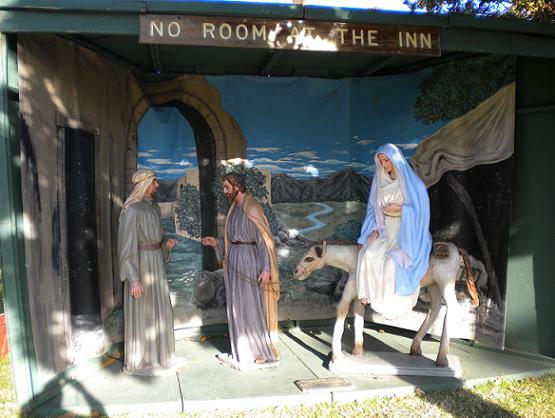 The Nativity scenes in Ontario have been a 50-year tradition on the Euclid Avenue median. (See my Christmas Day column for more.) What you may not know is that all 12 scenes did not debut the same year; they were built as money could be raised from 1959 to 1968. When did each scene debut? Here’s a list pieced together from Daily Report stories in the Ontario City Library files. Any thoughts or memories regarding the scenes? Post away below. I’ve been reading and enjoying your blog daily for the past several months, and just wanted to take this opportunity to say Merry Christmas, and thank you for your thoughts, photos, words and history lessons! Not to mention the restaurant reviews! I remember passing the nativity scenes on the way to school as a kid in the 1980s. I remember going all the way to the end even though we didn’t really have any business in Upland. Also the great big elephant on Euclid was a fun sight to see but for some reason they took it down about 10 + years ago. I believe that the elephant came from the Selig zoo which was associated with the Selig movie studios which was in, if memory serves, Edendale, now part of the Silver Lake area. My dad worked for the City of Ontario Parks/recreation from 1969-2001 and he helped put them up every year that the City was involved. It was a family tradition to go see them after they were put up every year when I was growing up. I carry that tradition on with my kids/grandkids. I even made the paper a couple of years back. So proud of my hometown.